NEW DELHI, India, July 9, 2013 (ENS) – There is evidence that some wildlife crime syndicates are linked to terror groups, India’s Environment Minister Jayanthi Natarajan told a meeting Friday of police, customs and wildlife officers from eight countries. Dr. Maheshwar Dhakal of the Bhutan-based SAWEN Secretariat highlighted the need for capacity building of law enforcement agencies of the eight SAWEN countries through networking and information sharing to combat wildlife crime in the South Asia region. “A concentrated global response, and empowering the South Asian region to act, is the only way that the menace of illegal wildlife trade can be dealt with,” said Niraj. Participants focused on National Environmental Security Task Forces; new initiatives in tiger poaching; trends in seizures; tiger genome projects; wildlife forensics, cyber forensics and DNA analysis; investigating wildlife smugglers and effective prosecution of wildlife crimes. The sessions were addressed by experts in wildlife crime, Interpol and CBI officers, forest officers including the directors of Panna and Jim Corbett National Parks, tiger conservationists, senior lawyers specializing in wildlife crime and forensic experts. 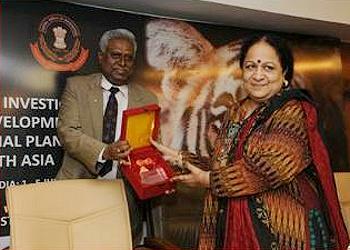 Natarajan pledged her country’s support for the conservation of wild tigers and all Asian big cats. 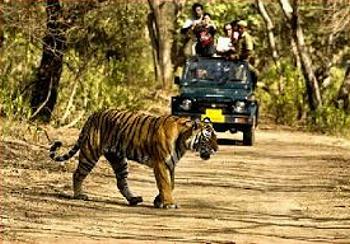 The New Delhi meeting was held under the auspices of Interpol’s Project Predator, which supports regional efforts for the conservation of wild tigers and other Asian big cats. USAID is a strong supporter and funder of Project Predator, and meeting participants took note of President Barack Obama’s executive order of July 1, describing how wildlife crimes are increasingly coordinated by organized criminal groups and establishing a Presidential Task Force on Wildlife Trafficking. The meeting in New Delhi was the first of two integrated training and operational planning meetings in Asia. A Training and Needs Assessment for Investigating Wildlife Operations in Southeast Asia is underway all this week in Bangkok, Thailand. Raising wildlife crime and other environmental crimes on the political agenda is also an objective of the Interpol Environmental Compliance and Enforcement events to be held in Nairobi, Kenya in November.